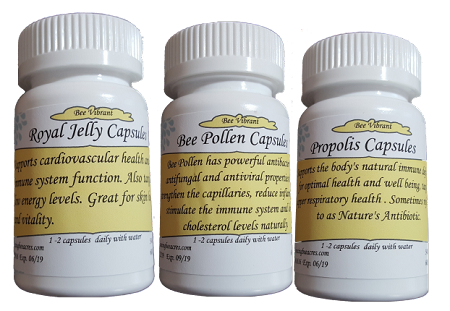 Royal Jelly, Bee Pollen, & Propolis is now sold in our new Trio Pack. You get the benefits of all three hive products in one convenient package. Each bottle is 60 capsules. For many years (~20yr) we purchase Royal Jelly caps, and Bee Pollen caps, and AMP all for the treatment of MS and wouldn't go a day without these valuable ingredients in our daily cycle. Thank you! These are the freshest bee products I have ever used in capsule form. They work very well in conjunction with the high quality bee venom I have also purchased through this company. I highly recommend them and would definitely buy again. Love all 3 products. Have told a number of people about it. You should get some additional orders as they all want to try it.